It was a great game against Kentucky. There were some bad calls. There was some amazing basketball. Kentucky had a great season…well, they had a season that was 99% great. Apparently the possibility of a team other than Kentucky winning was not being entertained by most of the press; certainly not most of the state of Kentucky(there is a hoof trimmer in Kentucky whose hubris prior to the game is duly noted and will be tossed appropriately back at him when the perfect opportunity presents itself); and judging by the post game interview the Wildcat roster was seemingly unaware of the possibility and ill-prepared to deal with such a “surprising” turn events. Meanwhile, the Badgers kinda did something awesome. All that is of very little consequence to someone who has faithfully and diligently filled out her bracket the past half dozen years or so, repeatedly writing in Syracuse or Louisville to take it all. Sometimes the NCAA Tournament can be a lonely, sad time and sometimes a gal just has to NOT fill out a bracket. But that doesn’t mean she doesn’t have her favourites. But, since her favourites were frickin no shows when it got down to the skinny numbers she’s left with what keeps many a sports fan alive- a burning dislike for a team that burns so hot that it keeps her warm on cold, dark nights. My dislike for the Blue Devils keep me warm at night. And it is still really cold here in Maine. Seriously, if a bunch of Darth Vader’s Storm Troopers were playing Duke for the championship I would totally be cheering for them, and of course hoping they shoot threes with better accuracy than they shoot their Blasters. So basically: Go Badgers. Beat Duke. 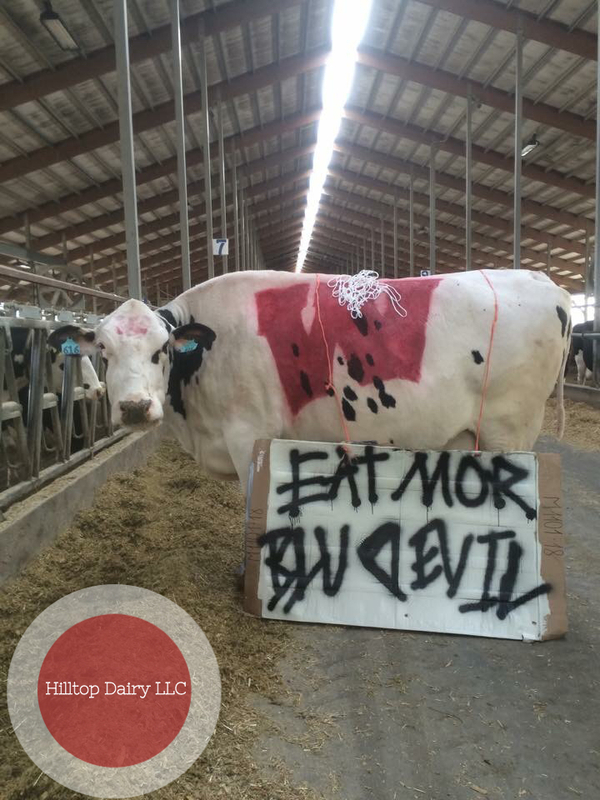 Rhona, from Hilltop Dairy, LLC, is The World’s Biggest Badger Fan … and she just gets me. 2) We’ve all had that teacher-the one who inspired us whether it was with a traditional method or the slightly, off kilter, “damn that was one cool teacher” thing. I am a big fan of education. I am an even bigger fan of educators. I know the problems. I know the complaints. I know the agendas and rhetoric that clog up the conversation. I am perfectly aware of the trials, tribulations and troubles that plague our public school system. I know the budgets, the theories, the problems, the gaps and the divergent philosophical differences. I also know the hard working folks who not only try to educate our children but try to do so no matter what it takes. My High School AP History teacher, Mrs. Brown*, sang the entirety of Johnny Horton’s “Battle of New Orleans” (and it was not entirely out of context…we were discussing the War of 1812). U.S. Revolutionary History is probably my weakest area of study with regards to American History-pathetic, I know, but it is entirely my own fault and not due to my education. (See, I am not one to blame my education when the failure and shortcomings rest squarely on my own shoulders…even the teacher who was literally institutionalized taught me valuable lessons) Anyways, I didn’t just remember the dates and the tall tales and embellished folk lore surrounding the War of 1812, I learned about the facts, the participants (a recent visit to Andrew Jackson’s Hermitage was accompanied by that song constantly playing in my head on a loop) all because Mrs. Brown took the time and made the effort to make the education an experience, rather than a chore. So for just a moment, forget your agendas and your axes that need grinding and recall that one teacher; that one educator. Recall the one who made the effort and it stuck. Now imagine an entire school with a faculty and staff willing to do pretty much anything to make the experience of education more memorable than forgettable and you have Camden-Rockport Middle School. And the best part of all this? Camden-Rockport Middle School isn’t unique. They are not the first school to do this sort of thing, nor will they be the last. And when the status quo is mostly folks willing to get down and get funky in order to engage a student and get them excited for learning then that is a very good thing. 3) It’s a great big hungry world out there and for every mouth to feed there is a mind that is hungry for information too. Sometimes it is hard to get good information to those minds. Especially if there are people making a lot more noise than you. I know, I know, I know…I drone on and on about science and facts and all those damn boring things when there are women in bikinis doing back bends,flaunting their meal plans, hawking their wares, bragging about how much they do to make the grocery store a safer place and commanding an army who just seem so much more interesting and a helluva a lot cuter than me (Personal Note: I can do a backbend.). Here’s the thing-if you have a question or need knowledge you need to do more work than a cursory Google search. You need to look beyond a meme. I know- you are busy. You want answers. You want to trust somebody. You aren’t the only one. But c’mon, if it is so important to you that you will boycott, march, complain, sign a petition or publicly deride someone, some company, something then you should probably be willing to put as much effort into your fact finding as you do your protests. So, maybe instead of depending solely on some babe you might consider exploring what scientists, nutritionists and yes, even farmers have to say about science, nutrition and food. I prefer to trust the folks who trust me. Like Kevin Folta. He not only knows what he knows, but he knows what he doesn’t and he knows who to trust. That includes farmers. He not only trusts us farmers, he wants to hear from us farmers. And he wants us farmers to speak up. As a farmer I would love for those who aren’t farmers to listen. I am even more stoked when someone asks me a question. (Between you and I: I rarely have a problem speaking up, it’s just the way I roll). I don’t spend much time trying to find the words that people WANT to hear but I am very forthcoming with the words that they NEED to hear, and that is the truth. It rolls off the tongue quite easily. It doesn’t always make me look good and it doesn’t always make them feel better. Sometimes it changes their opinion, sometimes it cements their opinion. But either way, they have the facts because they asked a question and they asked a person who would know. And they asked someone who was ready, willing and able to answer. If you are on SM and you like to have answers about food and science, whether you are a farmer, or not, then Kevin Folta is a good place to start. 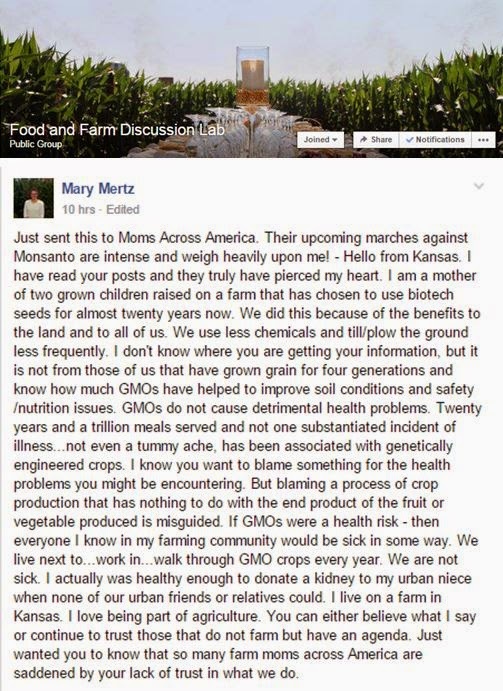 On Twitter @kevinfolta and on Facebook and whether you want to follow along with him is your decision but at the very least you should definitely give The Value of a Farmer’s Voice a read. * Mrs. Brown not only gave me a deeper appreciation for this ditty but because of her I instantly had an “in” with The Farmer as this is one of his favourite songs and my intimate knowledge and familiarity of it was almost as important to cementing his infatuation with me as my spaghetti sauce and my ability to easily carry two 5 gallon pails of hydraulic oil. ← The Audacity to Talk About the Science.